Image description: Gnomey–a garden gnome with white hair and beard (no mustache), wearing a red pointy hat, brown vest, yellow shirt, red pants held up with twine, and black boots–stands with a satisfied and friendly smile, holding onto his vest with his left hand and a rake with his right. 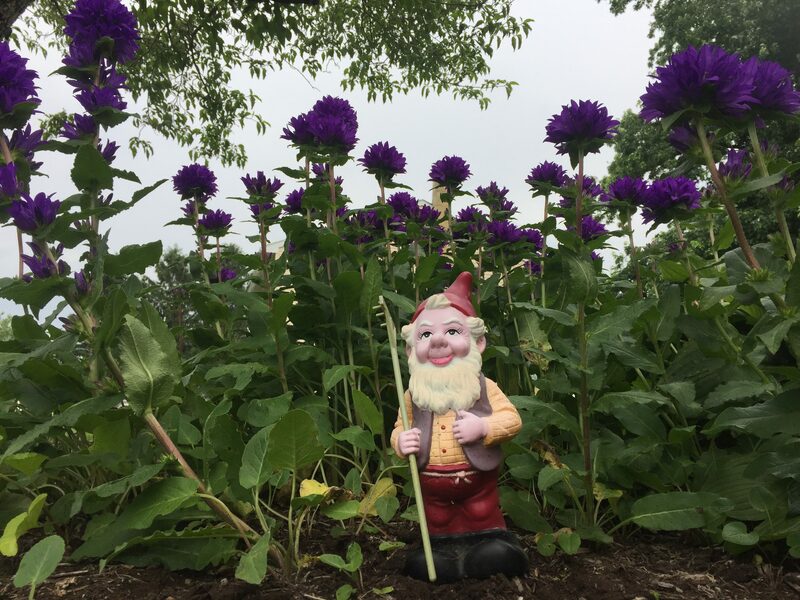 He is surrounded by a dense forest of tall flowers whose puffy purple blossoms tower above him on lush, leafy green stalks. Trees and sky can be seen in the background. It’s summer! Finally! Also, already?! As a student and teacher, I’ve always commemorated three ‘new’ years per year: Jan. 1, the start of summer break*, and the start of the school year. Each of these days marks a new beginning for me. Jan. 1 is the only new years day I celebrate with a fancy meal and a bonfire (though, now I think of it, these traditions might well belong in my other new years celebrations, too!). But on all of these days, I set intentions for the year ahead and resolutions for myself in motion. These intentions and resolutions don’t always stick, of course, but even a false start is a *start*. This year, this summer feels like a new kind of new start. I’m looking back at my first year as a full time professor, looking forward by setting goals for teaching, researching, writing, for personal growth, for my family. I’m also planning an epic family roadtrip and writing many lists of lots of things to get done and good things to read this summer. So, I’ve set a lot of resolutions this summertime new year, and many of them pertain directly to this blog. Here are some of them, starting with resolutions I’ve already put in motion and ending with those still in the works. Do yoga for at least 10 minutes a day. I call this my yoga experiment. I figured, I can do anything for 10 minutes. And I have–often even longer than 10 minutes–every day since the start of my summer break on May 17. Publish a blog post at least every 2 weeks. See above and below for topics. Research discourse about and opposition to the ADHA and document the fight to #SaveMedicaid in the US. Publish critical discourse analyses of arguments in favor of austerity on this blog. Read good stuff on teaching, education, disability, and communication and share notes here. I hope blogging about my progress on these fronts will help me to hold myself accountable, to reflect on process, and to critically examine both positive and dire developments. I also hope to offer some useful perspectives on the current fight for disability rights and the right to health care in the US, on communication and education and writing, and on yoga. So, thanks for reading, hope it’s useful! Comment if you have any suggestions for how to proceed or recommendations for stuff to read, poses or yoga resources to try, writing and publishing tools, etc., etc. * I prefer the term ‘break’ to ‘vacation’ because academic summers may or may not involve vacation and are never all vacation for any teacher I know. Summer hopefully involves some break from teaching, though I know teachers for whom this isn’t true, either.